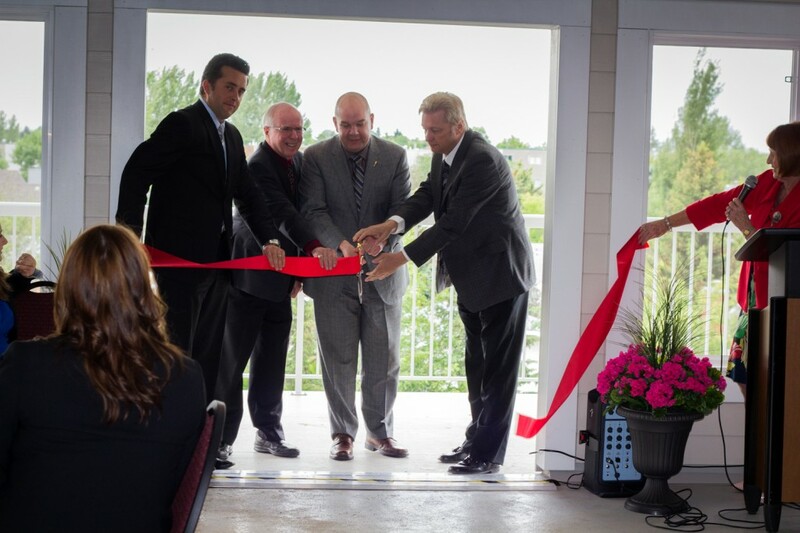 Edmonton, Alberta — The Governments of Canada and Alberta, along with Lifestyle Options, celebrated the official opening of the Chateau at Schonsee Square Seniors Complex on September 30th, 2013. The complex consists of 103 affordable housing suites for functionally independent seniors with 14 of those suites for seniors with disabilities. The Honourable Tim Uppal, Minister of State (Multiculturalism) and Member of Parliament for Edmonton-Sherwood Park, on behalf of the Honourable Candice Bergen, Minister of State (Social Development), along with Janice Sarich, Member of the Legislative Assembly for Edmonton-Decore, made the announcement today. Twenty of the affordable housing units are studio suites, 54 are one-bedroom and 29 are two-bedroom. There are also 21 market rent suites in the complex. The project is part of a continuing care community and has a supportive living facility on the same site. It is Green Built with mixed use commercial space occupying the main floor. Funding for Chateau at Schonsee Square Seniors Complex was through a joint investment of almost $10 million by the Government of Canada and the Government of Alberta. The funding is part of the $238 million equal investment made over 2009 to 2011, under the amended Canada-Alberta Affordable Housing Program Agreement, which includes funding under Canada’s Economic Action Plan. Annually, the Government of Canada, through Canada Mortgage and Housing Corporation (CMHC), will invest approximately $2 billion in housing. Of this amount, $1.7 billion will be spent in support of close to 594,000 households living in existing social housing. In Alberta, this represents an estimated 37,250 households. The remaining funding supports housing-related activities and affordable housing programs, including the Investment in Affordable Housing. These investments are improving the quality of life for low-income Canadians and households living in existing social housing, including individuals who are homeless or at-risk of homelessness, seniors, persons with disabilities, recent immigrants and Aboriginal people. Economic Action Plan 2013 continues this commitment with a federal investment of more than $1.25 billion over five years to renew the Investment in Affordable Housing to 2019. The Government of Canada will ensure that funds provided to provinces and territories support the use of apprentices, which will support training of skilled labour. More than 146,769 households across Canada are no longer in housing need as a result of funding provided under the IAH from April 1, 2011 to June 30, 2013. Through partnerships with federal and municipal governments, community groups, and the non-profit and private sectors, Alberta has made great strides to increase the supply of affordable housing across the province. Since 2007, the Government of Alberta has supported the development of 12,000 affordable housing units for homeless and lower-income Albertans through capital grant funding in 62 communities. The province celebrated achieving and exceeding its original goal of 11,000 units by 2012 in September. For more information on Alberta’s housing support, visit http://municipalaffairs.gov.ab.ca/housing.cfm. Lifestyle Options is an established provider of senior housing and care in Edmonton and surrounding communities. Their vision is to bring quality, affordable housing to senior citizens through innovative planning and design. 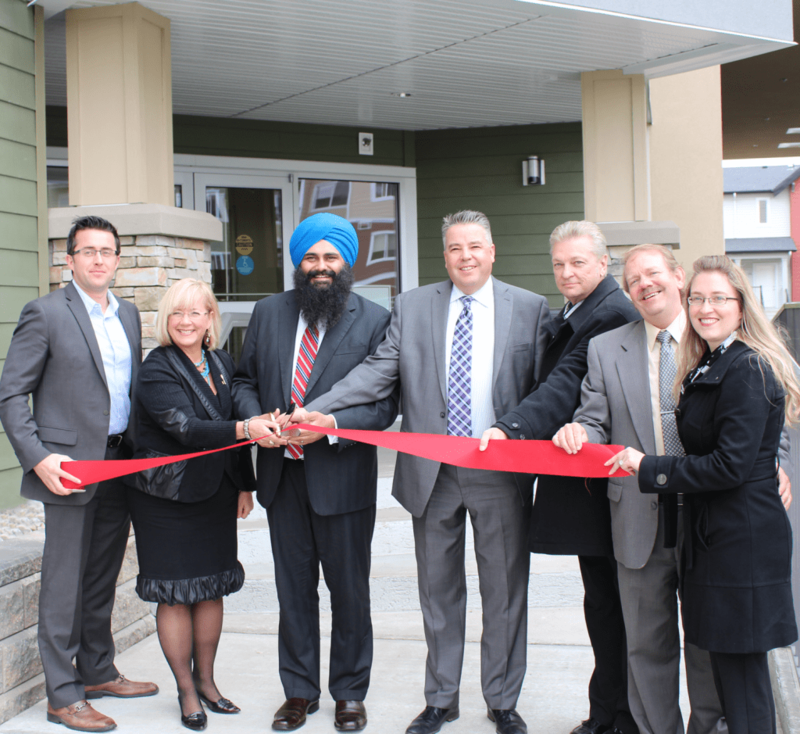 Edmonton seniors will benefit as Lifestyle Options Ltd. have opened the doors to Lifestyles Whitemud Retirement Community. The 160 unit seniors housing complex has been rebuilt after the original building was destroyed by an act of arson on May 31, 2009. The construction of the $27 million state-of-the-art senior’s complex includes $8 million in funding from the Alberta government’s Affordable Supportive Living Initiative and Alberta Capital Bonds. The design of the new Lifestyle Options senior’s complex incorporates a multitude of amenities and special features to provide residents with a more home-like atmosphere. Amenities include social and games areas, fitness and recreation opportunities, as well as a full service salon and food services. The project will also include 80 affordable studios specifically designed for a safe supportive living environment for seniors living with dementia. The main floor layout provides a safe living environment for residents. Many improvements to the original design were implemented over and above building fire codes to promote a safe, sustainable and accessible development. A meeting in 1996 between Ken Ferchoff, Carrington Group of Companies, and Renate Sainsbury, Life Options Ltd., led to the Lifestyle Options Retirement Communities concept. The Carrington Group, who has constructed quality housing in Edmonton for 40 years, was the ideal partner to build these custom seniors’ apartment style buildings. Lifestyle Options has since developed a new concept in seniors’ accommodation, operating four buildings in Edmonton and Leduc, Lifestyle Options Whitemud, Lifestyle Options Terra Losa, Lifestyle Options Riverbend, and Lifestyle Options Leduc, giving seniors an array of freedom, choice and independence, easing the transition into their new homes and lifestyle. The Lifestyle Options Whitemud project is part of the Government of Alberta’s $7.2 billion investment in public infrastructure for 2010-2011 that has strengthened the economy, helped keep Albertans working and provide core public services to maintain a high quality of life.